It is said that when asked about what he thought of the French Revolution, the Chinese foreign minister Zhu Enlai replied that it is too early to say. This famous quip about the French Revolution can be applied also to the consequences of World War II. This article is the final installment in a series of articles which dealt with the greatest conflict ever to have been fought and provides a short-list of the far reaching consequences of this event. The list of consequences should not be viewed by the readers as being definitive and I strongly urge them to add more or comment on them. The end of World War II in September 1945 marked the end of an international system centered on the European Great Powers. At the end of World War II Germany, Italy and most of France lay in ruins while Great Britain was bankrupt. Now there were only two great powers left: the United States which at the end of the war had an intact economy, an intact army and a virtual monopoly on the manufacture and employment of nuclear weapons; the other great power left standing, but nevertheless scarred by the Nazi onslaught was the Soviet Union, which had a large and intact army and was in control of almost half the European continent. The final demise of the European Great Power system led to the development of a bipolar world dominated by the flank powers: the United States and the USSR. The bipolar configuration of the international system was marked for the next 50 years by the Cold War – a political and ideological rivalry on a global scale between the US and the Soviet Union. With the end of the war and the demise of the European Great Power System (Kennedy, pp. 357-373) the process of decolonization occurred. The defeated powers which had overseas colonies or conquered overseas territories were forced by the allies to surrender them – this was the case of Italy and Japan. France and Great Britain, the great European colonizing nations were gradually forced to give up their empires due to the cost of maintaining colonies, the relative weakness of the metropolises in the international system, the development of violent and/or peaceful national liberation movements and foreign pressure coming from the US and USSR or from former colonies which supported the process of de-colonization. The demise of the European Great Power System and the destruction caused by the war led the Western European nation to explore and then embark on the process of European integration. Behind the protection provided by the armed forces of the United States deployed in Europe to curtail a possible Soviet invasion, the foundations of the European Union could be laid. A further consequence of the World War II was the redrawing and stabilization of the borders of Europe. Indeed most of today’s European borders are the result of World War II, the best example being the Polish-German border. The basic configuration of the Europe’s borders after World War II was confirmed by the signing of the Helsinki Accords in 1975. Despite post-Cold War evolutions in Europe, which saw the break-up of the Soviet Union, the disintegration of Yugoslavia and the peaceful dissolution of Czechoslovakia the vast majority of Europe’s current borders originated as a consequence of World War II. 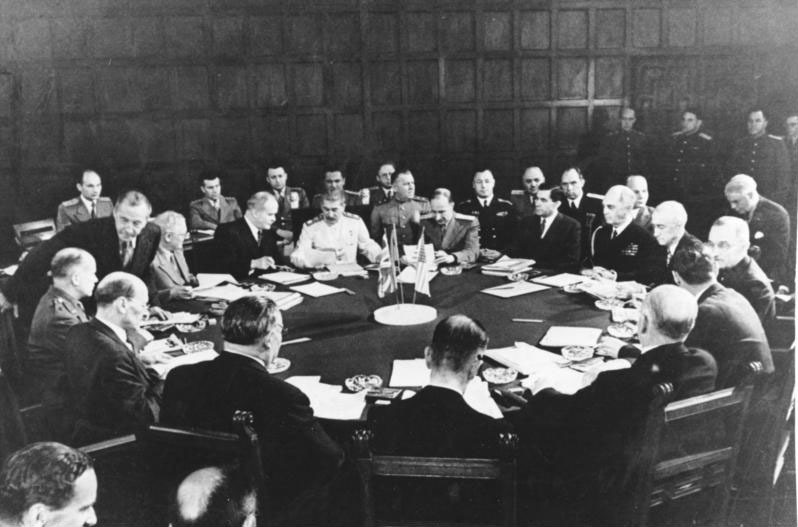 Another consequence of World War II was a renewed and somewhat misplaced trust in international institutions as a means to manage international politics. Despite the fact that it did not achieve its objectives of preventing conflict, the United Nations provided the necessary framework and the arena to discuss and debate some of the issues of the International System. The only nation to emerge with its economy intact out of World War II was the United States. Europe and Asia had been devastated by the war and the Soviet Union did not fare better either in economic terms, despite being one of the winners. The economic order created at Bretton Woods has partially survived to this day, being overtaken however by new economic developments. It should also be understood that the circumstances that led to the creation of the Bretton Woods international economic regime were exceptional and unique. The Bretton Woods regime is responsible in many ways for the post-war economic development and prosperity. The advent of the Cold War divided the world economy in two camps: free market economies and soviet style planed economies. The former colonies that gained their independence after World War II tried to combine the best of both worlds in order to develop and created economies that were neither free market nor planned (although most tended to be planned). The economic results in this case were dubious at best, the poor economic record of planned economies forcing the non-aligned nations to move towards market economies in the late 1980s. The list of consequences is obviously huge, but the first thing that comes to my mind is the anticommunist trend of right-authoritarian, military/conservatory regimes in Latin America and Southern Europe. Perhaps because I just started Costa Gavra’s trilogy dedicated to this type of regimes (Greece, Chili and Uruguay). As I said this list is not exhaustive, it represents only what came to my mind. However what you point to has to do more with the consequences of the Cold War rather than WW II. In Europe the authoritarian regimes in Spain and Portugal survived the war because starting with 1943 they supported the allied struggle more or less visibly. In Spain Franco abstained himself from following Hitler’s policies and did not join the Nazi cause, although he allowed the formation of a military unit to fight on the German side on the Eastern Front. About the impact of World War II on Latin and South America I really don’t know. I know that Peron was inspired by Fascism and Nazism and offered asylum to German war criminals, however other than that I am pretty ignorant of the real impact the outcome the WW II had on this region. One consequence that I can think of is that the outcome of the war reinforced the hegemony of the US in the Western Hemisphere. facand istorie contrafactuala pe scurt, crezi ca ar mai fi existat toate regimurile militare anticomuniste din America Centrala si pana in Cono Sur fara echilibrul bipolar de dupa razboi? Eu cred ca da! Pentru ca statele din America Latina si de Sud au evoluat din punct de vedere politic dupa castigarea independentei intre doua extreme: conservatorism si dictatura militara pe de o parte si revolutie pe de alta. Echilibru bipolar a ranvorsat o anumita tendinta (conservatorismul si dictatura militara) si a adancit clivajele dintre dreapta oligarhica si stanga revolutionara. E adevarat ce spui in cateva cazuri mari in regiune (conservatorism, caudillism, preeminenta armatei), dar nu cred ca SUA ar fi oferit acelasi suport si nu cred nu s-ar fi implicat cu aceeasi amploare in Sud daca nu ar fi fost contextul propice oferit de conflictul bipolar si de pericolul „revolutiilor” comuniste. Cat despre distinctia intre consecintele WWII si Cold War, uneori nu sunt atat distincte cat se intaresc reciproc. In acest sens am zis in primul mesaj ca politica externa a SUA in vecinatatea sa a suferit o schimbare de traseu majora dupa WW2 si da, in plin razboi rece. Un articol despre evolutia politica a Chile ar fi interesant. Nu sunt specialist in evolutiile politice ale acestei regiuni asa ca tind sa-ti dau dreptate in rest. Trebuie mentionat totusi ca inainte de WW II SUA a renuntat in linii mari la politica interventionista in emisfera vestica (de la dollar diplomacy a trecut la good neighbor policy sub FDR). Interventionismul american trebuie evaluat in raport cu ambitiile sovietice in regiune.